Nice Shingles Roofing & Exteriors is your one-stop-shop for roofing and exterior services for both commercial and residential properties in Stroudsburg and in the Poconos. We understand as a roofing and exterior services company that when there is an issue with your property, you need it fixed fast in order to avoid further damages. While this inherent need for a speedy fix might push you to hire the first company that you see when you search “residential roofing company” or “commercial roofing company,” we urge you to take your time in choosing an experienced and proven roofer. Nice Shingles Roofing & Exteriors is your proven roofing company in the Stroudsburg and Poconos areas. If you are interested in seeing what some of our past customers have thought of our work, we urge you to check out our testimonials page. Below, we have made a short list of the services that we offer, as well as a brief synopsis of what those services entail. Roofing – As a residential roofing company and commercial roofing company that services the Stroudsburg and Poconos areas, we offer our clients a number of roofing services. We only use the highest of quality materials to ensure that after your project is completed that the roof is built to last. Whether it is shingle roof installation, metal roof installation, or something as simple as a quick fix, Nice Shingles Roofing & Exteriors is the best company to get the job right. Below is a short list of the roofing services that we offer. Siding – Every house with a good roof needs quality siding as well. Luckily, when working with Nice Shingles Roofing & Exteriors, you get both a roofing company and a siding company. Servicing the Stroudsburg and Poconos areas, we offer quality roofing and siding construction, as well as quality, long lasting materials. Whether you need siding installation or siding replacement, Nice Shingles Roofing & Exteriors is the company for you. Below is a short list of some of the siding services that we provide. Gutters – While you have roofers on your roof, you might as well have them look at the gutters, the problem is that most roofing companies do not provide gutter services. Luckily, we do here at Nice Singles Roofing & Exteriors. 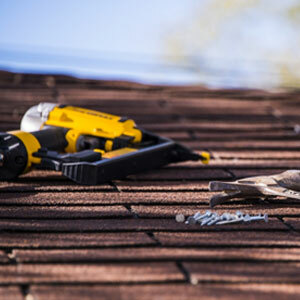 Our team of experienced roofers is well versed in the installation of seamless gutters. Our gutters are manufactured with machine rolled aluminum, ensuring their functionality while also providing an improved aesthetic to traditional gutter systems. 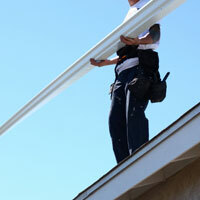 Below, we have listed some of the additional gutter services that we provide in the Stroudsburg and Poconos areas. Skylights – Living in the Stroudsburg and Poconos area, you have an excellent opportunity to light your home with natural lighting. At Nice Shingles Roofing & Exteriors, we offer skylight installation so that you can allow natural lighting to pass through the roof of your residential or commercial property. We offer the following skylight services. As we stated earlier, when your roof or exterior is damaged, it can be easy to make a rushed decision on what roofing company to work with — after all, you want it fixed before it causes further damage. That being said, it is incredibly important to pick an experienced and proven roofing company to get the job done both efficiently and correctly. Nice Shingles Roofing & Exteriors is just that. Contact us today for a written quote for your property repairs.